Ebb and Flow, also known as Flood and Drain, is one of the most widely recognized hydroponics systems out there. It is intermediate level in difficulty, relatively low-cost to set up, and extremely versatile. This method allows you to easily alter your garden, adding or removing plants as you wish without affecting any of the surrounding crops. 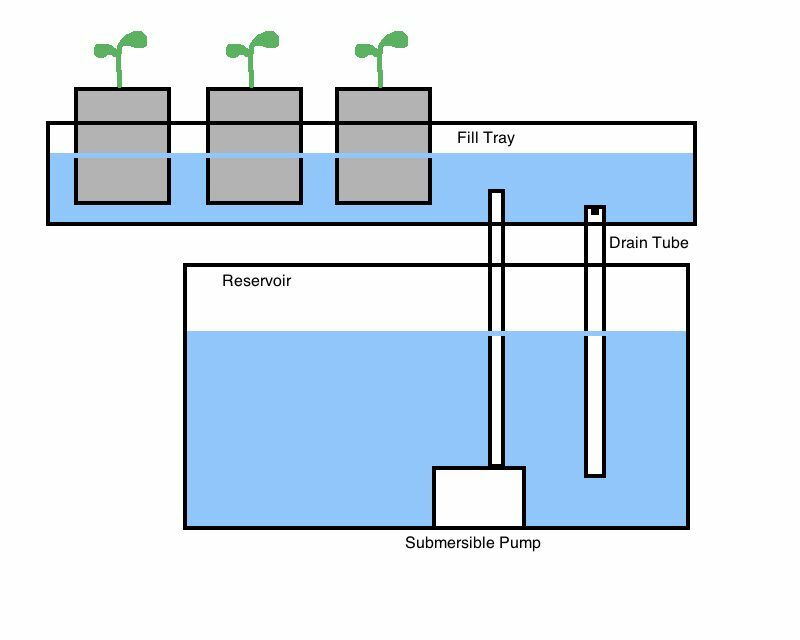 Like other methods, the basic concept is very simple–plants are placed in a tray, which is periodically filled with nutrient-rich water pumped out of a reservoir below. The system uses gravity to return the water to the reservoir to be reused. This system seems complex to beginners because it involves so many different components, but they all come together quite easily and can be assembled in very little time. Once assembled, this system needs little maintenance and produces plants efficiently with very little electricity or water use. The basic components of the Ebb & Flow system are the plant tray, reservoir, and submersible pump with timer. The plant tray–also called a flood tray–is a large, shallow container on a tall stand, in which you place your plants. Plant your seedlings in half-gallon perforated pots filled with a growing medium such as Perlite. The pots that your seedlings are in should be about twice as deep as the flood tray. The flood tray is pumped full of nutrient-dense water from the reservoir below, which flows up through the bottom of the pots to the roots of the plants. The water is then drained back out, allowing the roots to become completely dry and oxygenated before flooding again. The reservoir is placed directly below the flood tray's stand. It is connected to the tray via a fill tube and a drain tube. The fill tube attaches to a submersible pump with a timer, which controls the flow of water up into the flood tray. The drain tube allows gravity to pull the water back into the reservoir after flooding so that the water can be reused. You can use the same water for about a week at a time, making sure to renew the nutrients every time you change the water. The submersible pump with a timer allows for a lot of control in this type of system because you can customize the length and frequency of watering based on your gardens' needs. Ebb and Flow systems can seem daunting to beginners, but they are perfect for the hobbyist with a bit of experience who is looking to "upgrade" their system. This type of set up allows for more options than some of the beginner set-ups such as Lettuce Rafts. If your tray is large enough, you can plant almost anything. It is very popular to grow certain plants like tomatoes and beans in these systems because trellises can be attached directly to the plant tray's stand. Because of the constant movement of water, it is important that you thoroughly scrub, clean, and sterilize your growing medium, reservoir, pots, and plant tray in between seasons. It is not uncommon for harmless algae to grow on these surfaces, but improper cleaning can lead to mold and insect infestations that could ruin your future harvest.